Driven by Purpose: Charities that make the difference explores the crisis of identity at the heart of Australian charities and offers practical advice on rediscovering purpose that drives and shapes. Stephen Judd, Anne Robinson and Felicity Errington delve into the "who" and the "why" central to the purpose of a charity. This book analyses the historical and social context of Australian charities and considers the relationship between charities and Australian society. 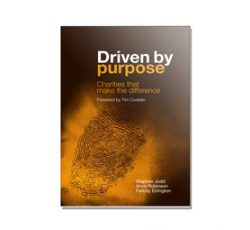 Organisation leaders, managers and those interested in the way charities can impact their communities will find Driven by Purpose a refreshing and practical approach to this important topic. And while the book draws on Australian experience, the principles and approaches described are applicable across the globe, not only for charities or not-for-profit organisations, but for individuals interested living life on purpose. Driven by purpose was awarded second place in the Australian Christian Book of the Year award 2013.